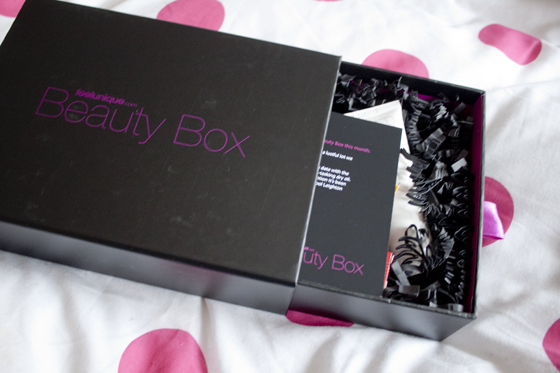 RIP Feel Unique Beauty Box, They announced today that this would be their last beauty box. I wasn't sure if I was actually getting this box as it wasn't showing up in my account, but it turned up on my door step this morning. I'm actually kinda saddened as I think Feel Unique was my favourite of all the beauty boxes on the market. I think it says alot that I got two for free but still kept paying for the Feel Unique Box. 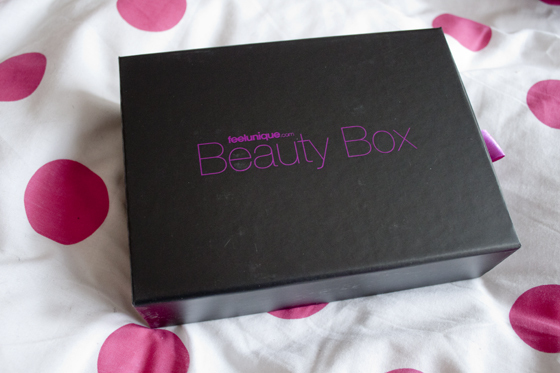 I always felt their products were the most consistent, ones that I'd actually like to use from brands I like/brands I'd like to try, This box was no different. I actually have a review of the Phillip Kingsley Elastizier coming up in the next week as its one of my favourite hair products. Its a pre-shampoo treatment that makes your hair so soft and nourished, It makes my hair so sleek and easy to manage. I've also tried the The Nuxe Huile Prodigieuse Oil before from a preview beauty box, this one is great for the tips of your hair, especially if you have Ombre hair like me and the ends get a bit dry! 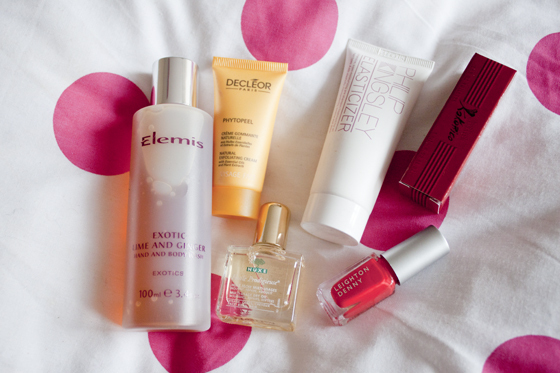 I also use it on my cuticles as its great as a all round body oil. The Decleor Face Peel sounds interesting, I have a Clarisonic which I use for exfoliation, but I already like alot of other Decleor products so I hope I'll like this too. The Leighton Denny nail polish in Viva la Diva is a beautiful rich creamy red, I dont own any red polishes so its a nice addition. 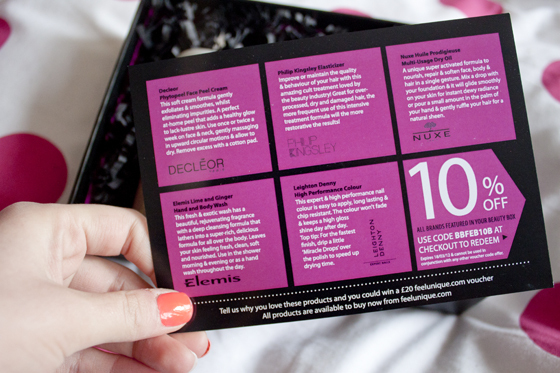 I quite like the Elemis body wash, I've not tried it yet but its got a lovely fresh exotic smell to it, a little bit musky but I'm very interested in trying it. Like I said, I'm sad that this is the last one. Feel Unique did say in their email they are putting together something bigger and better to replace this service. But it will be missed by me for sure until their new service comes out. 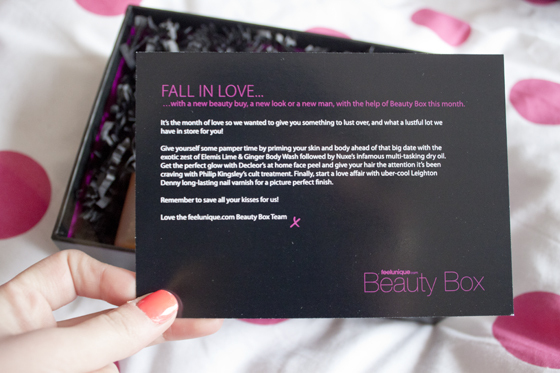 Maybe they have realised its time to get out the beauty box game before its too late! can't believe this is the last one! crazy! I love the colour of your Leighton Denny! Great box, you can never have enough dry oils too, I use them constantly! OMG I unsubscribed two months ago and now they bring the best box last? Anyone know if you can sign up for this box? I didn't try this one.. this looks like a good box though! Check out my Body Shop - Chocomaina giveaway! Actually a bit sad I never got to try this box :/ I went to order it and saw the 'we're closed' message. I cant wait to see what they've got planned tho! It's such a shame that they're stopping sice their products look so lovely! Such a pity.